Christmas is one of the most exciting times of the year, but can also prove to be the most stressful if you aren’t prepared. Our Ambassadors, ‘Foreman Dan’ and Dani, have helped us narrow down the essentials for a stress-free, Christmas trip in your Mazda. 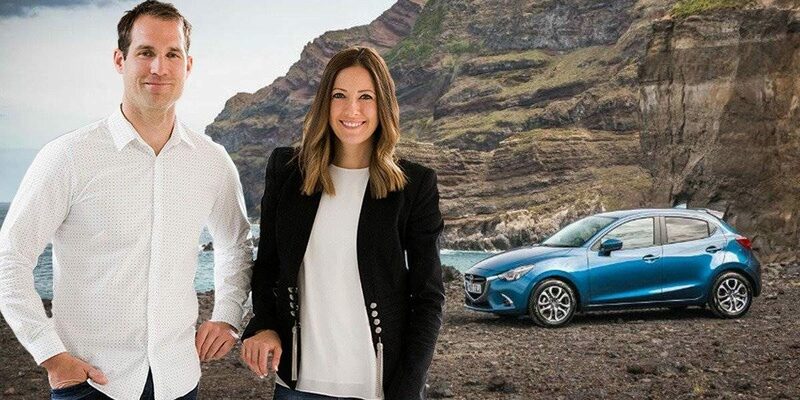 With filming of The Block and Healthy Homes Australia TV over for the year, there’s time for Dan and Dani to wind down and make the most of scenic drives in their Next-Gen CX-5 and BT-50, courtesy of Berwick Mazda. “We are building a house in Blairgowrie on the Mornington Peninsula which has become our new ‘go to’ for taking our Next-Gen CX-5 – especially to the wineries in Red Hill,” Dan says. “Don’t host! In all seriousness, do all the decorating in the days leading up and ensure each family coming to lunch brings a dish. We divide Christmas lunch in our family and this year, even though Christmas lunch will be at Dan’s parent’s house, we will take the prawns and also some drinks. It becomes less of a financial stress on the host by dividing food duties”. “This Christmas break I will be relaxing as much as I can. When I say relaxing, I mean golfing, jet skiing, and Netflix. “Tow your jet ski to your BT-50 and head down to the Peninsula. There’ll be many trips to the beach this season for me. I need to recharge for my biggest year yet. The Block will kick off in early February, then our business, Red Door Project, is fully booked for the year with 6 big renovations. Dani and I will also be building our own beach house down in Blairgowrie”. 1. Get your vehicle serviced or necessary repairs done before you go. Make a service booking online. 2. Check your Mazda’s brakes, battery and tires are in good condition. Order Mazda spare parts before your trip to avoid any mechanical issues out on the road. 3. Be prepared for any emergencies – which includes securely down the family Pavlova in the back seat as well as packing a first aid kit. 4. Make sure child restraints are properly fitted. If you need help ask our ACRI Accredited team in Service to fit your child restraints – it’s FREE for Berwick Mazda customers. 5. Take regular breaks while driving or share the driving with someone else. 6. Ensure any pets you are bringing along are safely harnessed and have plenty of water. 7. Do a tow check, whether for your trailer full of presents or for your jetski for post-Christmas water fun. 8. Check you have your emergency contacts, including family, Roadside Assistance and Insurance details on hand. 9. Connect your smartphone to your car and take advantage of traffic alerts, alternative routes and petrol stations. 10. If your children can see out of your family SUV take advantage of playing visual games like ‘I-SPY’ rather than electronic devices. Christmas is Family time. Need to get your Mazda Christmas-trip ready? Call the team at Berwick Mazda 03 8796 6222. On behalf of the Berwick Mazda team and Dan and Dani we wish you a Merry Christmas.